Hi there, my name is Taylor Dunne and I am a Front Desk employee at Denali Princess Lodge. Here is one of the many adventures that can be experienced during your stay with us! 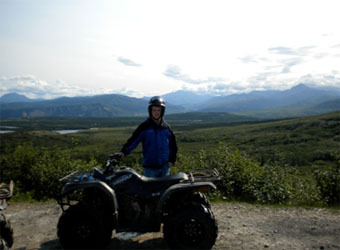 In my first week at Denali I did the ATV tour. What you are seeing in this photo is the view of three valleys converging. It was a breathtaking view. Nothing is quite as large as Alaska. We rode for an hour and a half through the highs and lows of the trails — mud and creeks included. Check back soon for a photo of my next adventure!